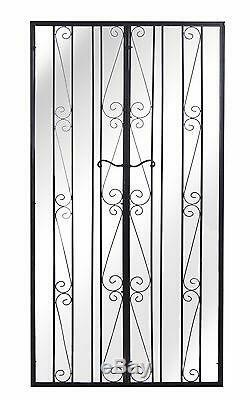 6ft x 3ft Illusion Mirror Gate - by Reflect. Height 1.84m (6ft ½in). Please note: Mirror is flexible acrylic and reflection may not be perfect. Metal frame - sturdy and strong. Powder coated frame - resistant against rust and corrosion. Shatterproof and weatherproof acrylic mirror. 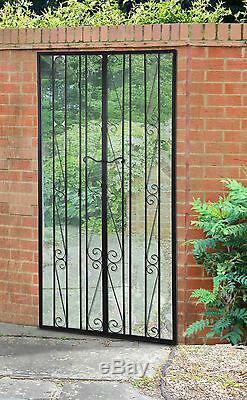 Garden gate style gives the illusion of more space in your garden. 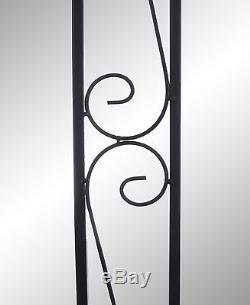 This delicate wrought iron style mirror is fashioned into the style of a garden gate. Your garden will gain a whole new dimension of beauty. An easy method to add the appearance of more space, garden mirrors are growing in popularity as features for outside areas. The sturdy metal frame of this mirror will ensure that it does not come apart in poor weather, and lasts, for your enjoyment. The powder coating on the frame helps to make it resistant to rust and corrosion which allows it to be suitably kept outside in all weather. 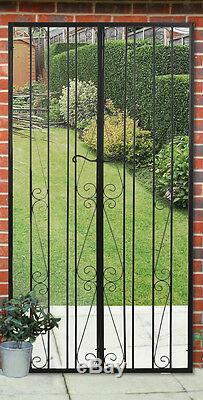 The garden gate design creates the illusion of a bigger garden , giving a sense of depth to smaller spaces. The shatterproof acrylic mirror will not be affected by poor weather conditions, and will not crack and shatter like glass, making it a safe alternative to use in the garden. Powder coated steel is strong and durable , as the powder coating acts as a barrier, preventing water access to the steel below. This means you get the strength of steel with water resistant properties. This manner of protecting metal from corrosion and rust is much better than paint, as powder coating is longer lasting and sprayed on in such a manner that no gaps are left. Powder coating has long been used for bicycles and car parts, which just proves that it is long lasting and able to keep steel from rusting. Thicker than paint and easier to apply, powder coating is becoming a well-known way to protect steel from corrosion. Whilst a glass mirror might be traditional within the house, it is not always the best idea for use in the garden. Acrylic provides a good reflection and is incapable of shattering if blown over in the wind or knocked over by playing children. Additionally, acrylic is waterproof as standard , unlike mirror backing on glass mirrors, so it will not become smeared or stop reflecting properly. Acrylic mirrors provide a much safer alternative to glass in a garden situation. 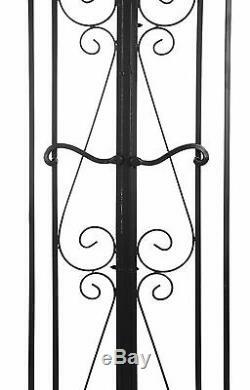 Illusion mirrors are becoming very popular in small gardens at the moment, to give the illusion of more space and a bigger area, waiting just beyond the gate. The way the mirror reflects your garden makes it look as if the gate opens onto another piece of land, and thus gives a sense of a larger garden waiting just beyond. Your friends and visitors will be fooled into thinking you have more garden than you do, whilst you get to enjoy the sense of space that this mirror brings. 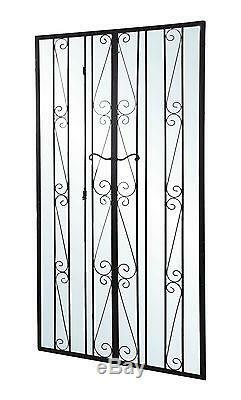 The item "Large Black Gate Effect Mirror Metal Outdoor Acrylic Garden Illusion Door" is in sale since Thursday, February 19, 2015.